On the upper level, two other good sized bedrooms will meet the expectations of their occupants. Other lovely appointments include a full bathroom and a mezzanine, always appreciated in a cathedral space for an unimpeded view of the beautiful living room below. A “must” when we talk “chalet”. Be sure to look at the related models, reversed and including natural materials for exterior cladding with plan # 2957. Looking for other other casual living, vacation or cottage designs? 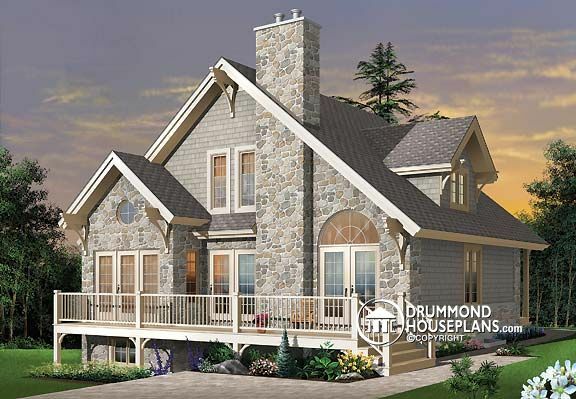 Check our Vacation and Cottage Design Collection or Create a “New House Plans – Latest Trends” Alert to receive all of the latest designs direct to you by email!